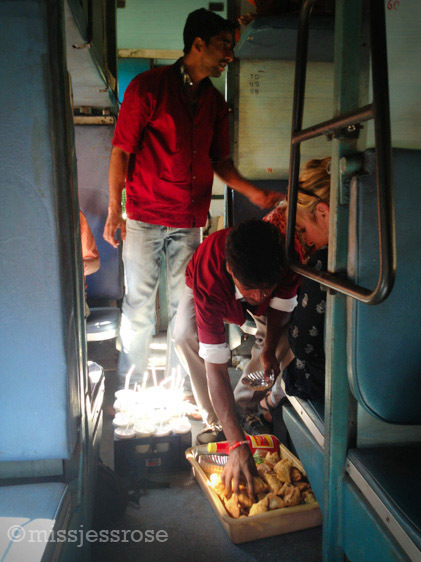 I'm on a train heading east from Goa to Hampi. Food hawkers jump on and off at every stop rushing through the cars shouting, selling refreshments. 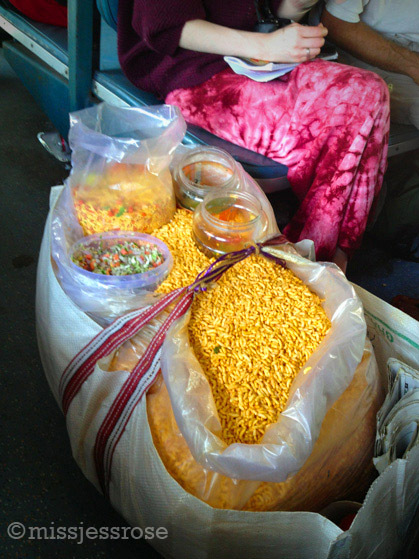 I want to taste everything that passes—samosas served from a worn cardboard box, crispy masala rice snacks in a giant plastic garbage bag, fresh mango lassis carried in a tattered milk crate. Yet I cringe as the vendors grab food with their bare hands, passing it to customers wrapped in sheets of used newspaper. Every time I see a potentially unsanitary food situation I can't help but imagine a colony of foreign bacterium marching through my gut. Before this trip, in an attempt to prepare myself for India's poor sanitation, I read all about the invisible slimy things that want to live inside me. I still can't decide if so much research educated me more than it grossed me out. But for the record, I have not been sick. Yet. Part of the adventure, or complication depending on how much you care for the glory that is Indian transportation, is getting there. Hampi isn't exactly easily accessible. 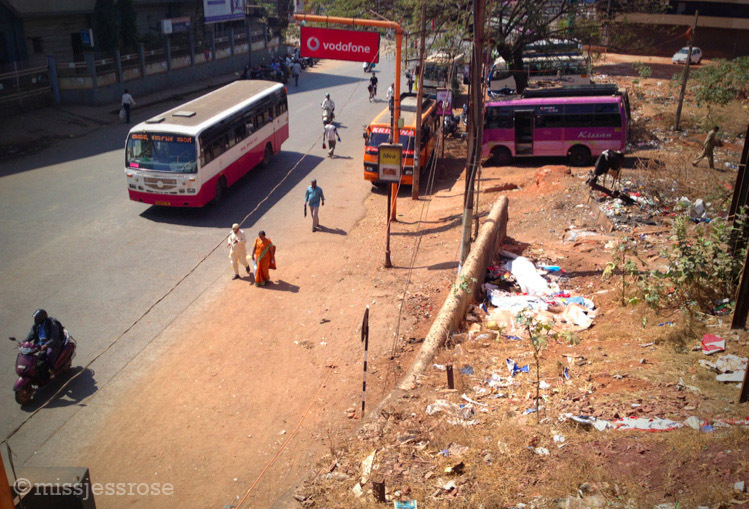 It takes about eight hours to travel from the Margao train station inland to the dry and deserty town of Hospet, 340 kilometers away. We are lucky to have snagged train tickets, more often than not this route is fully booked. Pro-tip for travelers who hope to visit Hampi: book your train a few months in advance, otherwise you'll be stuck riding the bus (and good luck with that). From Hospet I'll find a rickshaw to deliver me the remaining thirteen kilometers to the historic and remote site of Hampi. But for now the train ride is its own adventure. The undulating landscape changes from early morning glassy mist, to rice paddies, to golden fields and then arid sprawls of brown desert. I gaze out the open window where rural scenes unfold as quickly as they disappear. There is trash everywhere along the track. We pass clusters of shabby hovels. People squat to relieve themselves in plain sight. Farmers walk behind yaks plowing their land. Pigs scamper freely. A cricket game is just starting on a dusty patch of dirt. I hold my breathe as we pass through a cloud of acrid smelling smoke caused by a pile of burning plastic garbage. Temperatures rise as the day crawls on. There is so much here that is vastly different from all that I know. For some reason the long lull of train travel offers time to reflect on both the unfamiliar and the past three months of my vagabond journey. Sitting on the train watching India unfurl, I think about how far off the beaten path I am right now. I'm moving this way for the very first time. I feel like a true explorer of the world. I remember how battered and burned-out I felt back in the cubicle, and smile at the contrast. The rest of the world is so much more alive than American media wants us to believe. Almost every day it blows my mind. I am so often filled with gratitude, awe and wonder at this life now that I'm on the road. Finding the spaces between the fences, stepping tentatively into the chaos can propel us in directions we never thought possible. Those openings reveal whole wide worlds of unknowns. And there is so much beauty in all that possibility. So listen to that childlike voice whispering in your ear, let's go exploring, let's go on an adventure through the jungle! You owe the seeker and dreamer inside you the chance to forge a new way. You should go, even if the way is not clear. Because no matter what, stepping off that well-worn path will always be scary and intimidating. It will be unfamiliar and uncomfortable. But you should do it anyway, even if it seems reckless or impossible. It is a thousand times worth it.